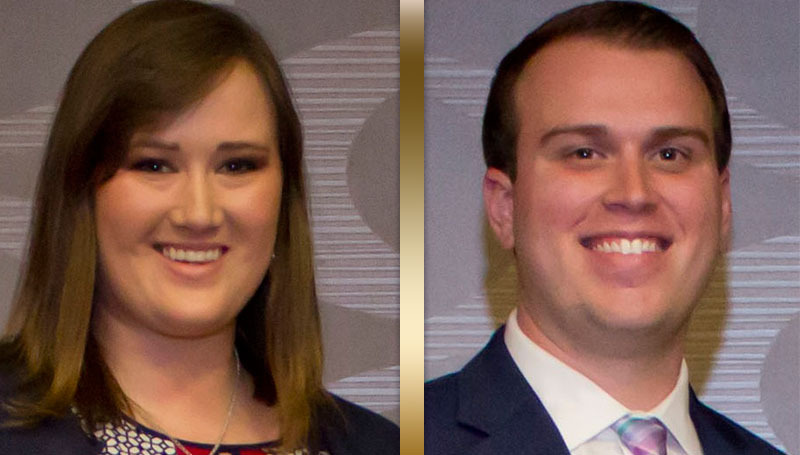 Mary Black and Brett Dieckhoff were recognized as two of Missouri’s Outstanding Beginning Teachers March 29 at the spring conference of the Missouri Association of Colleges for Teacher Education (MACTE), held March 29 at the Columbia Conference Center in Columbia, Mo. Both are graduates of Missouri Southern State University and teach in the Webb City School district. Black, ’16, is an eighth grade special education teacher. Dieckhoff, ’15, teaches high school social studies. The Missouri Association of Colleges for Teacher Education is a state affiliate of the American Association of Colleges for Teacher Education (AACTE), and serves as the voice for educator preparation programs across the state. The Outstanding Beginning Teacher Awards recognize teachers in their first two years of service who demonstrate excellence in serving children in school districts across Missouri. Recipients are selected based on recommendations from Missouri and national teacher education programs, and from candidates’ school districts. The ceremony was held at the Columbia Conference Center in Columbia, Missouri, and was hosted by MACTE President Dr. Diana Rogers-Adkinson, MACTE President-Elect Dr. Alexander Cuenca, and members of the MACTE Executive Board.